How did it parallel to the Cold War? The Space Race was "competition" between Kennedy and Khrushchev to see who could get to the moon first. By getting to the moon, both countries believed that they would be a step ahead of the other if they put a man on the moon first. In 1961, Kennedy vowed to get to the moon before the end of the decade. Khrushchev had already got someone in space, but not to the moon. A month later, the U.S. got someone to space, but again, not to the moon. NASA began to push for Project Apollo, the project to get US astronauts to the moon after they got to space. Unfortunately in 1967, three astronauts died while testing the space ship. 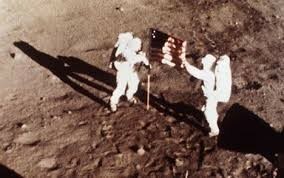 Finally, in 1969, America finally put two astronauts on the moon (Buzz Aldrin and Neil Armstrong). How was it similar/different to the Cold War? It is similar to the Cold War, because there was no actual fighting between America and the Soviet Union, but it still was highly competitive. In the Cold War, they were both racing to build a nuclear bomb before the other country. 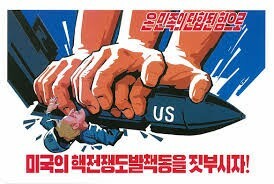 Both countries wanted to become a world power by threatening a nuclear attack. The Space Race was similar because both countries battled with words instead of actually taking action. 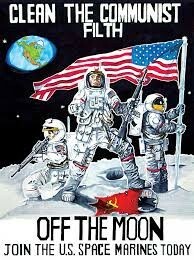 There was a lot of propoganda regarding the Space Race, to get people to support their countries' effort to get to the moon. 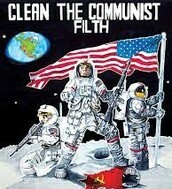 Many people thought propoganda was important for the Space Race.